You wouldn,t know but you would comment. This info takes almost half of the first screen of the forum. Is it so hard to shorten it to You are using old, unsuported theme. I guess wololo won,t comment this, shame he doesn't care about users opinion. My problems with new theme is related to my browser i tried others which can handel new theme. Wolfmade wrote: You need to calm down. The reminder is there to let the user know that the old theme is not supported and they won't be getting any ninja releases. The staff of this site has better things to do than support years-old themes. You should thank us for not removing the theme altogether. It was removed altogether, then put back after a while. Because instead of the usual green Ninja banner, the old theme has this "WARNING: OLD THEME IS USED, LULZ?!?!?!?1!11!" banner? Shouldnt be a problem. If the theme worked flawlessly for years, it should continue to work. I disagree. The page works on mobile devices. Easy to use, just requires a bit of zooming in & out, perfectly doable. Why not? I used to support them in the past, so why doesnt it anymore? Cause of the red "old theme" banner? Pathetic. or any new features that we might introduce on the new theme. but there is no plan to fix any issue reported with this theme. Read what I wrote above. It worked for years, why should there be any bugs as of now? The Z wrote: Read what I wrote above. It worked for years, why should there be any bugs as of now? As we introduce new features, etc... to the forum (which has better chances of happening now than before, given my new schedule), we might break the old theme. This is just a disclaimer that we will not fix it if such things happen. If users and their opinion are less important than features, you have some problems with priorities. Users tell you that this "mobile theme" is not so mobile for them. You wanted to know why, I wrote that. And what will you do about it? I will find a way to remove this Old theme info, it's not impossible. Not from your site, just from my vision in web browser. I realize there's lots of other updates to be made, but you have to give me some time. This site is not my entire life, I have a job and a family to attend to. There are also other aspects of the site that need attention, so I cannot be everywhere all the time. To respond to people's complaints, I have put back the old theme. But I had to add a visible warning there, to make sure people realize this is not a supported theme. You, today, are making the change intentionally because you don't like the new theme, so you feel you don't need the warning message. But other people, in 1 month, in 10 months, etc... will also want to change, maybe because they think it's cool the forum has a different theme. So It will need to be clear at that point for these people, who are not aware of the new theme "battle", that they are using something deprecated. Do you understand that? We have more than 50'000 members on this forum. There's 29 of you who switched to the old theme. I'm willing to be nice, and this is why I put that theme back, but if you guys cannot be satisfied, just because of a message in the header, then I don't think I want to be any more nice than that. You represent a noisy minority of the forum, and if I wanted to be fair, I should dedicate 0.06% (29/50000) of my time for you guys. That's 4 seconds a day, assuming I spend 2 hours on the site per day. By putting the old them back in place and replying to your angry messages, I've already done my share for the year. With that being said, I've reduced the size of the "warning" banner so that it is less intrusive. But the banner needs to stay. This banner is not for you guys, it's for the people in 10 months who will switch to the old theme without understanding the consequences. Rauliki, if you want to remove that "old theme" banner, use greasemonkey. It's a utility that allows you to modify the content of pages dynamically. This will be a good programming exercise for you. It is much better to see the old theme banner smaller, thanks. 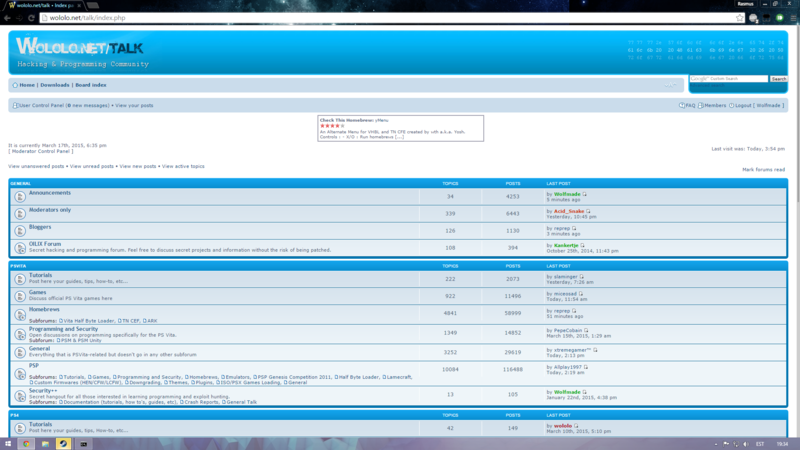 I've changed layouts of my forum or web page when you were asking ppl what this 'internet' thing is all about. If you want to inform people about old theme why don't use registering email and topic like this one? Holy moly. If it bothers you that much, just use grease/tampermonkey already, as shown here. We don't like spamming users' emails. Users might miss topics like this because it's a topic like any other. We can't keep this as an announcement forever and have it get in the way of more important things. The red banner ensures that people who switch to the old theme are aware of the consequences. It's for THEM only. It's pointless to keep a sticky/a-level topic just for the few who want to use the old theme. Is that really hard to understand?